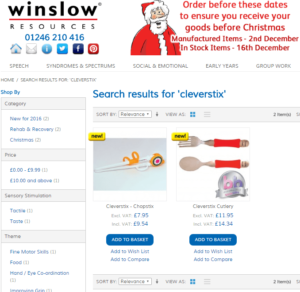 Both the Clever Fork & Spoon Set and CleverstiX child development cutlery are now available from Winslow Resources, a trading arm of parent company ROMPA Ltd. Winslow® have specialised in providing resources to education, social and health care professionals for almost 30 years. The products are available now in time for Christmas from the Winslow Resources website, and from their 2017 catalogue. The news follows recently received feedback that not only on the effectiveness of the award-winning Clever Fork & Spoon Set, but also how children find them visually appealing, and are therefore more willing to use them compared to less attractive caring cutlery alternatives – thus providing a psychological and well as a physical breakthrough! Meanwhile the intense fine motor development offered by CleverstiX has recently been re-affirmed by comparing their benefits with Tweezer Grippers.